Walking with Jesus: Day 6: Matt. 3:13-17; Psalm 6 - Why Did Jesus Need to Be Baptized? Day 6: Matt. 3:13-17; Psalm 6 - Why Did Jesus Need to Be Baptized? John the Baptist was at the Jordan River baptizing people with a baptism of repentance. Yesterday, we looked at repentance. So, when Jesus shows up to be baptized, John asks Him a very good question: "I need to be baptized by you, and do you come to me?” In other words, why would Jesus, the Sinless One, need to be baptized by John? He didn't need to repent, did he? No. Jesus did not say that He needed to repent, because He had never sinned and would never sin. So, why the baptism? 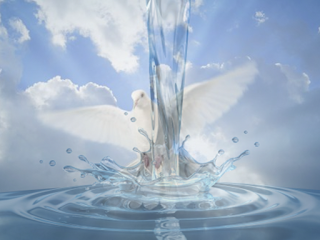 In God's anointing of Jesus with the Holy Spirit, we get a wonderful picture of the Trinity: God the Father sends God the Holy Spirit to anoint God the Son. The Father is the Sender, the Son is the Sent and the Holy Spirit is the Power. Be gracious to me, O Lord . . .
Give me the grace to weep over my sin. Break my heart over my rebellion and selfishness. But also, in Your mercy, silence the voice of my adversary the devil, who accuses me night and day and would overwhelm me with shame. Deliver me from his accusations. I praise You, O God, for such great grace and such wonderful salvation! In Jesus' name, by His righteousness and for His name's sake I pray, Amen. I love your site. Thanks for sharing!